1. 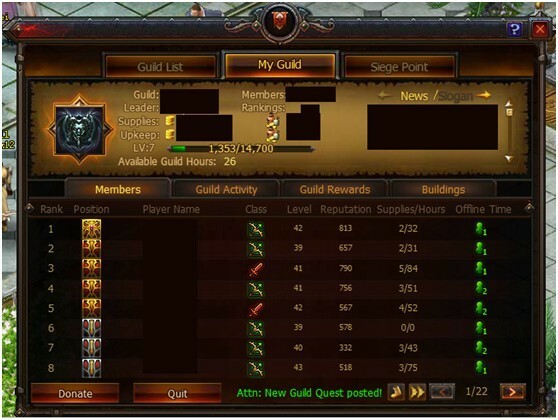 Check basic information about the guild: Guild Name, Guild Leader, a list of members, News, etc. 2. 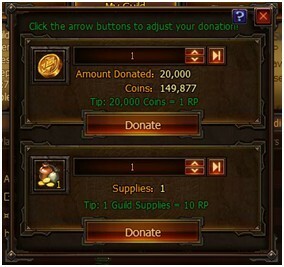 DonateSupplies or Coins to the guild: Click the “Donate” button to access the donation interface and earn Guild Reputation Points. Left: A list of players who have applied to join the guild. You can accept or reject the applications. Right: A log of each guild member’s activity in game. Daily Reward: Log in everyday to claim a reward from your guild! The more consecutive days you collect your daily guild reward, the better it gets! Guild Wages: Guild members can log in and claim wages from the guild once per day. The EXP and Coins you can get from claiming guild wages will increase according to your level. Spend 10 Cash to double your wages!